I have to admit that I had never heard of the Padre Island Star block but I liked it right away. I also knew that it looked familiar. Upon further investigation, I noticed that two other blocks are made of exactly the same patches, but by colour changes and placement, you get entirely different looks. I have linked to both of these blocks below, so you can see for yourself. 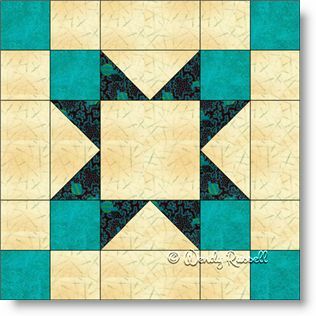 This is an easy block and therefore a good choice for a beginner quilter. Simple patches made of "checkerboards" (a very common unit made by placing four small squares together), are present in each of the corners, and my favourite patch -- flying geese -- make up this very versatile block. Setting your quilt on point is how the two sample quilts illustrated are laid out. What interesting quilt setting can you create?